Sautee onion, garlic, carrots and celery in a splash of olive oil. Add spices and stir for few minutes until onions are translucent. Drain and thoroughly rinse kidney beans. Add to pot along with tomatoes (including juice), beef, balsamic vinegar and Worcestershire sauce. Remove coriander leaves from stems and chop finely. Stir into chili at the end. 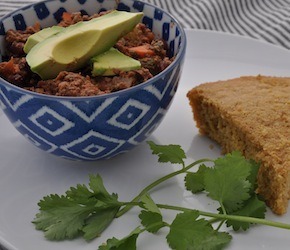 Serve with extra coriander, avocado and a slice of skillet cornbread.